Were woolly mammoths and saber-tooth cats wiped out by a giant impact from space? About 13,000 years ago, the megafauna of North America began to die out, and the world entered a brief cold period known as the Younger Dryas. But what drove the giant beasts into extinction? A controversial new theory claims a giant space impact was the culprit. Between this and the Solutrean hypothesis, this is apparently the week for controversial hypotheses on North American prehistory. The Younger Dryas impact hypothesis has been around since around 2007, and it might actually be the subject of even fiercer dispute than the Solutrean model, considering its proponents and its detractors can't even agree on whether the supposed evidence to support it even exists. Could the first humans to reach the Americas have come from Europe? Here's what the model states, at least in one of the more popular versions. 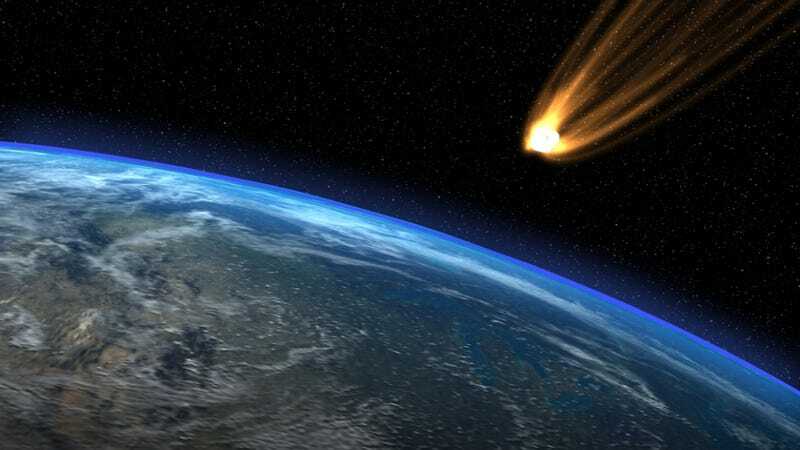 12,900 years ago, an unusual type of impact occurred, most likely a rare swarm of either comets or an unusual type of stony meteorite known as carbonaceous chondrites. Another possibility is an air burst similar to what exploded above Tunguska in 1908, though several orders of magnitude greater. Either way, this would have hit somewhere in North America, most likely in the glaciers north of the Great Lakes, and the combination of the devastation from the initial blast and resulting, continent-wide wildfires would have wiped out most of the continent's megafauna and likely much of its human population. It's a dramatic idea, but it has its problems. For one thing, there's no evidence in a population decline in humans at around that time, and if anything even less evidence for those colossal wildfires. What's more, while megafauna did go extinct around that time, they didn't all die out at exactly that time, which rather defeats the point of presupposing an impact that should kill them all in one fell swoop. There's also the question of why only certain species went extinct — even if you're willing to grant that megafauna were just generally more likely to go extinct than their smaller counterparts, why would large species like bison and grizzly bears have survived, where giant sloths and dire wolves didn't? And there's still the question of how isolated populations of mammoths and ground sloths survived for several thousand years after this supposed extinction event. So yes, this is very much an alternative hypothesis — bordering on fringe, honestly — and if there is any truth to it, it's likely not as straightforward as the current version of the model suggests. And now, an international team of researchers have come up with the latest possible piece of evidence to keep the Younger Dryas impact hypothesis alive, at least for a little bit longer. Specifically, they say they have located a thin layer of dark sediment dating back to about 13,000 years ago. The layer contains items like nanodiamonds and impact spherules that, according to the researchers, are best explained by a cosmic body striking the earth and scattering debris over a wide area. They found evidence of a particular type of nanodiamond known as lonsdaleite, which is only found in cosmic impacts. The spherules also showed evidence of high velocity collisions that likely make their origins extraterrestrial. This particular evidence points to a large asteroid or comet fragment entering the atmosphere, likely at a shallow angle. The researchers say this rock, probably several hundred meters in diameter, struck Earth and in turn melted rock, burned biomass, and generally threw the environment into upheaval. Its impact was likely principally felt in North and Central America, though the researchers say this ties into evidence of similar sediments found elsewhere in South America, Greenland, and Western Europe — the same evidence that the model's opponents have dismissed as, well, not really there. So what to make of all this? If this new evidence does hold up, then it's certainly good news for this alternative model, considering the only layer that shows similar nanodiamond and impact spherules dates is 65 million years old and marks the final extinction of the dinosaurs at the hands of a giant impact. But, based on previous debates on this model, that really is a big "if", and I wouldn't necessarily bet on this new data gaining widespread acceptance. Only one thing's for sure — the debate over North American prehistory is not going to be a quiet one any time soon. Original paper at PNAS. Image by Hunor Fonze, via Shutterstock.